There is an old Kiganda proverb to describe the walk of person who suffers from a deformed walking style, often caused by jiggers. Ow’embaliga atambula awoza malala (“The person with deformed feet walks with pride to hide his deformity”). This walk is not just painful but also erratic as the walker treads carefully to avoid causing himself pain while seeking to maintain his balance. The best way of maintaining both balance and pride is to point the feet in different directions. Lurching from side to side, Ow’embaliga is prone to cause destruction of whatever is in his path. The story of the embaliga walk in Uganda begins in 2003. However, the embaliga defect precedes this period, its roots lying in the economic and social disparities that plague the country. Uganda is a country with immense natural resources that could potentially underwrite a comfortable life for its citizens. However, it is home to some of the world’s most wretched people with over one third of its population living in absolute poverty. Very many Ugandans are unable to meet their daily basic needs in terms of food, shelter and security. In the rural areas, the poor struggle to eke a living off the land with ever diminishing returns for their efforts. With few options and nowhere to go, they remain rooted to the countryside entertaining dim hopes of a better future. In the cities, however, one finds a different reality: the wealthy live in prosperous enclaves suffering none of the tribulations of the poor and enjoying lavish lifestyles. This disparity – which informs the embaliga twitch – has significant implications for the future of Uganda. While many Ugandans wonder how to feed themselves, the political elite compete with one another to control scarce resources. Ethnicity, regional disparities, religion and politics form the sub-text of the disagreements, conflicts and divisions between them. In northern Uganda, more and more people are displaced as insurgency rages. Their poverty, bitterness and trauma are compounded on an almost daily basis. They see the government as a regime of Southerners set on elimination of the Acholi people. In the South, however, where there is relative peace, the northerners are seen as rebellious people who seek to destroy the unity of Uganda. This tension interferes with the country’s smooth movement forward. Thus progress occurs in a contradictory and haphazard manner. Even as gains are made on some fronts, significant losses are recorded on others. The embaliga lurch leaves its mark visibly. These regional and political sympathies influence voting in the 2006 elections, which takes place under a new constitutional agreement that allows the current president to run for another term. The Baganda advocate a muganda leadership, citing various faults in the balalo (cattle herders) leadership of the preceding decades. People in the east, on the other hand, argue that it is now their turn to rule, and seek to field their own candidate. In spite of the complex political reality, the incumbent regime wins the 2006 elections comfortably. After the election, Uganda remains firmly anchored to the global economy as a pliant client state of the richer countries of the global north. In return, the Ugandan state continues to receive large subsidies that underwrite remarkable social programmes. The Universal Primary Education Programme (UPE) is extended to Universal Secondary Education (USE) raising literacy rates even higher. The campaign against HIV/AIDS continues with anti-retroviral drugs made readily available at medical centers countrywide. NGOs and numerous advocacy and political groups are not exempt from the donor largesse as they too implement a wide variety of social programmes around the country. However, in spite of this massive influx of donor funds, little changes on the ground. Is it because the programme priorities are set from the outside by the donors? Is Uganda traveling a journey whose itinerary and destination are not set by Ugandans? As Uganda aligns its policies closely with those of its foreign donors, and even opening its soil to foreign military bases, it becomes the subject of criticism from other African states. Uganda begins to record its own casualties in the ongoing war on terror, as disaffected groups carry out terrorist attacks against local targets. In spite of the regional differences, economic liberalization continues apace and the private sector thrives off lucrative donor contracts and export opportunities abroad. Exports of new cash crops such as vanilla and moringa olifera are increasing. The discovery of oil in western Uganda drives the country deeper into the control of its external partners as lucrative concessions are parceled out. Corrupt deals line the pockets of those few individuals with the right connections. A number of import-substitution enterprises emerge to service the needs of the emerging middle class by making toys and assembling domestic appliances. The wealth of those controlling the private sector increases in leaps and bounds whilst wages are kept low for the majority who work in these industries. 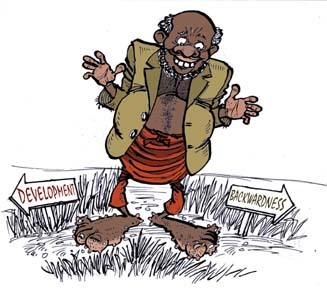 Land reforms enable investors to freely buy large tracts of land from small holders. Land that was previously under food crops now produces a variety of crops for the local and export market. Game ranches and exclusive natural reserves slowly push peasants off the land. Unable to compete, many smallholders take the money they are offered for their land and move to the cities or retreat to smaller plots. As agro-business acquires larger plantations, the social and economic life of many Ugandans is changed. The heavy footprints of the emabaliga walk can be seen – one foot pointing towards the wealthy hills of Kololo, the other knocking over traditional, once self-sufficient rural livelihoods. With the environment increasingly strained, the National Environmental Management Authority (NEMA) and the government seek to limit damages to the environment by promoting alternative renewable energy sources. However, the rising population, deforestation, soil exhaustion and demand for energy for industrialisation accelerate environmental destruction. Unpredictable seasons disrupt agricultural production, and average temperatures seem to be rising. Will the environment continue to sustain our activities? Is Uganda becoming a desert? How should we respond to climate change? No one really knows and many are fearful. The uncertainty of the embaliga walk is shown once again. In an attempt to decongest the overflowing camps for internally displaced person in Acholi, people are relocated to the sub-counties. Largely abandoned to their own devices, the inhabitants of the camps live miserable lives and seek to fend for themselves through desperate measures. Attacks from remnants of the rebels make life in the camps insecure. Though well equipped, the armed forces seem to be unable to make headway in flushing out these bandits. A state of neither war nor peace reigns. By 2010, the people from the rural areas are flocking to the city in droves. They come in search of employment and survival only to find that urban settlements offer neither. Informal settlements spring up and expand on the fringes of the city. 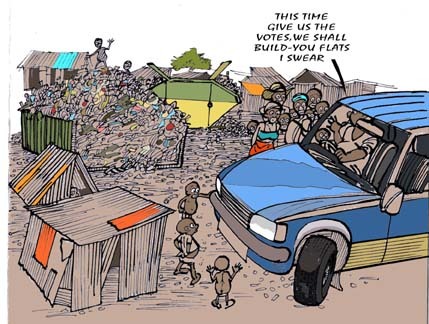 Makeshift homes are to be found in spaces around garbage disposal heaps, sewerage drains and solid waste centers. Jua-kali artisans fashion implements and articles using rudimentary technologies for use by the poor. Life in these settlements is harsh, but nevertheless vibrant. The newcomers bring their villages into the cities, along with a lively sense of creativity, independence and self-reliance. Resilience and solidarity enable many to withstand adversity. They share the little they have; new networks of trust evolve allowing people to survive the harsh life of the slums. They are removed from the political games of the elite, survival being their primary preoccupation. The shrinking job market and government retrenchment programme causes many households to suffer – particularly those of the small middle class of professionals who were employed in the civil service. Emigration becomes an option for many young people who seek better opportunities abroad. A few lucky ones leave whilst large majorities are forced to survive off their wits. Social ties and family bonds disintegrate and the Ministry of Health reports an increase in the number of HIV infections recorded around the country with the informal settlements recording the highest rates of infection. Paradoxically, at the same time Uganda is recording an improvement in the status of women. How come this strange situation? The number of women occupying parliamentary seats and occupying public positions is on the increase. However, the beneficiaries of this increase are wealthy women from the elite circles whose life does not mirror any of the challenges of their poorer countrywomen. The embaliga walk indeed! By 2020, Uganda is a country of disoriented people who have lost their relationship with their ancestral lands. Identity and solidarity are defined by wealth (or lack thereof). The countryside is largely in ruins and abandoned – save for the occasional plantation – as many small-scale farmers, unable to eke a living off the land, have moved to the towns and cities where they ended up living on the fringes. In the north, thousands of internally displaced persons continue to live in cramped camps that are neither friendly nor conducive to normal social relations. A generation has grown up in these camps that is inured to a hard life of scarcity interspersed with brutality. Surviving by the slimmest of threads, the lives of the internally displaced persons are torn between the ‘embaliga’ of the deprived and that of the depraved. Is this a lost generation? How can their despair be shown some hope? As 2025 approaches, Uganda is a fragmented country. Old bonds have broken down to be replaced by new ones – the emergence of a pidgin culture and a subsequent crisis of identity are the outcomes of this process. Ugandans who benefited from the newly minted wealth of the past decades or who leveraged their connections to the powerful political and military elite do well. They work even harder to strengthen their positions within the closed ranks of wealth and power. The poor, however, remain abandoned to their own fate. Access to social services – health and education in particular – worsens, as these facilities are increasingly rundown. They develop and nurture their own social networks to cope with the situation the find themselves in. They look at the wealthy and privileged with envy and hope for a time when they too will be able to take on the elite. The balance of the once proud Ugandan nation is increasingly harder to maintain. As Ugandans face the years ahead, which wounded foot will take the next step of the Embaliga walk? In which direction and with what consequences?